A man has died after a powered paraglider crashed near to the Royal Birkdale Golf Club. The aircraft crashed on land next to the famous course - which has hosted 10 Open Championships - at about 19:00 BST on Thursday and burst in to flames. Merseyside Police said the man was pronounced dead at the scene. "We are still establishing the facts and the identity of the person and inquiries are ongoing," a police spokesman said. Police confirmed the aircraft involved was a paramotor. It consists of a motor-driven propeller, worn like a backpack under a paraglider wing, according to the British Hang Gliding and Paragliding Association. 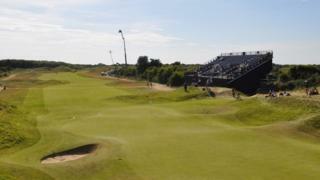 Royal Birkdale said the crash happened on council-owned land adjacent to the club, in Southport, and the course was unaffected. Road closures were put in place, including on Coastal Road, Shore Road and Weld Road.